Nope. After seeing so many anti-GMO activists with those bumper stickers and knowing what they have done, I definitely do not #feelthebern. I do not want my children to ever act like this. They will not be buying people’s domain names and making up fake websites for them. Nor will they put threats of crop destruction or hate comments about issues they aren’t educated about. They will be held fully responsible for their actions and know it. In a world where there is too much bad behavior already, I won’t add to a new generation that accepts it. We need more upstanding citizens that will work together and be collaborators and think about the future, not at the issue of the moment. We need critical thinkers and not hobby activists who threaten our future. We need problem solvers and innovators. We don’t need insulting, childish, and blockers progress in the name of conspiracies. These people will lead us no where and when a real problem arises, they will turn to science to solve it. That is the truth that they refuse to accept. Yesterday I had a chance to participate on a civic and civil discussion about GMOs and Pesticides in Hawaii. I was on the panel with John Purcell of Monsanto, Dr. Hector Valenzuela, and Kauai County Council member, Gary Hooser. I took a day off of work to participate and sent my baby to his sitter to do this. My hope was to get students and the general public a better grasp on this issue affecting Hawaii. It was not surprising that several anti-GMO activists were in the audience, which I thought was good because they need to hear about this issue. As I prepared for this discussion, I had stumbled upon some very interesting findings that pointed to me that this is environmental radicalism front and center in Hawaii. I was told that people had come to our various islands to consult to them about issues in their community that they wanted taken care of. The group was called the Community Environmental Legal Defense Fund that’s based in Pennsylvania. I had discovered this group through a radical environmental group known for it’s militant tactics called Deep Resistance Green. The things I read about these two groups were disturbing. There was assumptions that all corporations were bad and that government could not be trusted. The course of action was to create a protest and use sabotage and various methods legal and illegal to help protect nature at any cost. It was the doom and gloom scenario that man was ruining the planet and it must be saved. It’s no wonder that Gary and Hector kept repeating the words corporations and chemicals over and over. As I thought about it more, facts just don’t matter in this debate. This is a debate in ideology if you think about it closely. Here, the farmers and scientists, are operating under the assumption that we are feeding the world and looking for ways to do it better and differently. They rely on concrete data and measures and collected observations to make this happen. They are optimistic and hopeful and look for ways to sustain themselves. There is a embracing of technology and advancement. On the opposing side, they simply believe that this technology is not natural and will ruin the earth and biodiversity. They embrace the old ways of doing things and want to reject these technological advances for themselves and for others. Giving the technology to farmers in developing countries will spell out advancement in these cultures and a move to a more modern life, something that they find dissatisfying. They consider tampering with nature something utterly horrible to the species. They are protecting the rights of nature at every cost, which explains the lack of intellectual honesty throughout this movement. The most concerning issue that I worry about is this attitude that there is no need to consider feeding the world. If I follow the radical environmental lines of thinking, they think that feeding the world means more people and more harm to earth and that is the war that they are fighting to save. This shortsighted thinking lacks the realization that we are a global community and that we are ever changing and progressing as humans. Some of us in modern societies have lost a sense of appreciation and can’t find meaning, they turn to saving the planet as their meaningful activity in life. I now can see clearly why the feeding of the world message simply doesn’t resonate in the public. So why do I care so much about this issue? We are global citizens and my three young children will grow up in the world that I can help create. I can chose to not speak up and get people to think or I can do it. I do not subscribe to the belief that nature is greater than humans. We have to find balance in how we grow our food and use the environment to do so. We must be able to adapt to the changing climate and be prepared for the future if anything. To completely shut down any advancement or new technology can only set us back and actually cause harm in protecting it. The movements of the moment like the anti-vaccination, anti-fishing, anti-dairy, anti-hunting, expansion of the national whale sanctuary, community based fishing management, as well as the anti-ag are suddenly clear to me as I read on some of the backers of it. This is an industry of itself, the protest industry. Here’s just one of the groups in it. Because it shoves humanity into a role of relative unimportance, Deep Ecology has been a fringe movement since its birth in 1970s Norway and Romania. With the backing of Doug Tompkins’ money, however, Deep Ecology and its logical offshoots have quietly moved to the front of the environmental feeding trough, passing “shallow ecologists” (what used to be called “conservationists”) on their way to a stunning level of influence. This man, Douglas Tompkins, made his money through corporations like Esprit and North Face as well as Patagonia. Once he was rich, he decided he needed a cause and started funding these environmental groups, one of which is the Center for Food Safety. As much as Ashely Lukens of the Hawaii Center for Food Safety likes to portray the image of someone who is out to protect people, let’s be very clear here, that is not the end goal. This groups operates under the assumption that we don’t need more people on this planet and giving tools to feed people means more harm to the environment. I’m floored to have come to that realization and remain stunned. The rich, well fed people have funded a selfish movement that ultimately denies every human the right to food. I’ve seen a comment stating that just educating people in developing countries will solve the birth rate. Um, no, it’s not that simple. If you don’t eat or lack enough nutritious foods, you can’t develop properly and think or problem solve well. A hungry person can’t be productive at all and become a contributor to their countries. If your mother isn’t fed well, her baby is already disadvantaged from the start. It’s a really vicious cycle that isn’t easily escapable. Some people will think that because we don’t see those people, some 795 million based on UN estimates, it’s out of sight out of mind. Sure we don’t know who they are but we are a part of the global community and eventually, something will happen that will make it affect us. As Ethiopia is struggling with a drought, we as a developed country have the responsibility to help others with aid. If a war breaks out and people flee these countries, they need to go somewhere and much of the time, they land up in developed countries. One can’t say that it’s not our problem. Eventually, there will be a need for us to intervene and we will be affected by this. I’m speaking more about biotech and the need for access to technology because I want a world where my kids will have peacefulness and not hear about instability around the world. I don’t want to see my son have to be drafted into some war because of turmoil caused by our selfish food fight. My children deserve a world of peace and so do the other children in the world. Don’t get in the way of that goal, be a part of a solution. Food is a social justice worth fighting for. I have been so dismayed seeing the activists once again playing the “these people are immigrants so their jobs aren’t needed” card. The cold callousness of these kinds of comments make me unbelievably sad. We are living in 2016 and not in the 1950’s or 60’s, where discrimination was rampant. Those people who spoke out against this faced harassment and even lost their lives. Have people forgotten that this is Hawaii where many people from around the world came together to create our beloved local style? We are people of many colors that figured out a way to work together as a community. It took many hands to build the Hawaii so many of us love but is slowly being torn apart by fear and misinformation. Does the color of our skin tell a story? It sure does. My dad’s hands are brown but they have done some amazing things in his lifetime. Those rough, calloused hands have fixed tractors and vehicles for decades. It has built stone walls and put up fences to protect his farm and field. He’s used them to rework a John Deer tractor into a forklift. His hands can tie amazing knots to tie down loads of hundreds of pounds. He’s also picked probably over a million pounds of papaya, sweet potatoes, taro, cucumbers, beans, and other veggies over his lifetime. His hands have had a huge impact upon Hawaii even though it isn’t obvious. The biggest feat that his brown hands have done is something that most people can’t measure. He’s managed to raise a family and taught them how to give back to the community and seek education. We are just like the others in the community. The activists try to put down a certain class of people because of their skin color. Brown is because of the hundreds of hours spent in the hot sun cultivating the land and breaking their backs to grow crops that come back to us as food. (Note: it’s not the artificially induced brown from lying on the beach to absorb carcinogenic UV rays.). Some may speak in accents that sound funny to you and eat foods that smell weird, but they are the true pillars of our society. What they do allows us to be free to do other things. As I look at my dad’s brown hands, I’m proud to be a daughter of such a person. When it comes down to it, the farmers, whether it be papaya farmers or seed farmers, they are the ones closest to the earth and have their hands in the dirt. Many folks with brown hands have learned the the value of hard work and opportunity. They teach those lesson to their children who become future CIOs, therapists, nurses, farmers, and other professionals who give back to the community. Having brown hands should be a symbol of respect for what they learn and pass on to the next generation. Think about the story about those brown hands because they have a story that you’re missing. Every Sunday is my “cook for the week” day. I pull out the biggest pans and try to cook the thing most of the family will eat. One kid doesn’t like meat or veggies, another eats everything, one only has 4 teeth, and my husband wants more veggies. So, with all those dietary preferences, it’s pretty hard to cook one dish that suits everyone’s requests. I landed up cooking a favorite which was Japanese yakisoba, or fried noodles. It’s made with Japanese noodles, veggies, a little IARC class 1 carcinogen, Spam, some dashi (soup base), furikake (rice condiment), oyster sauce, pickled ginger, and some garlic salt. This is comfort food for lots of local families here in Hawaii. It’s nothing special but definitely a favorite. As I thought about what to put in it, I realized that there really is nothing outstanding in it. Everything in it tastes good. Fried noodles are sold in convenience store here in ala carte containers that we call bentos. If you don’t know what it is, you’d probably bypass it. I thought I should share the #healthyfood I feed my family. This is #crueltyfree #meatless #glutenfree #pesticidefree #gmofree olive oil infused noodles. No animal was harmed in the #ironinfused can derived from the hills of the Pennsylvania. The red ginger shreds are colored with #ecofriendly #organic #allnatural beets. The flavoring is derived from #vegan oysters. The Napa cabbage and stir fry was grown with the #moonrhythms and #permaculture methods. The sprinkled seaweed comes from the deep oceans of Japan where the whales swim and dolphins play. Doesn’t this sound delicious??? As I wrote it, I started laughing to myself. We well fed folks really love a good story about our food. As much as I despise the massive amounts of useless labels on the GMO free products, it’s giving consumers a seemingly better story about what they are eating. Thanks to the media, the consumers want to know the stories of their food. If I pick up a bag of tortilla chips and put it next to a GMO free, organic bag, guess which bag tells a story? The bags that give a nicer story is what appeals to the consumer who has no idea about what it took to grow those corn chips. It’s the same with buying local too. If the story sounds good, they’ll likely buy it and get a good feeling from it and who doesn’t want to feel good? The honesty of how much we love stories comes from the mouth of babes. My eldest daughter has been engrossed in a new series of books called the Rangers Apprentice. She can’t put the book down and will sneak it in the bathroom and read it while showering. I had to end that habit because of all the water landing on the floor. She gets so caught up in it that her baby brother has learned how to get a great reaction from it. One day I heard yelling and found the baby grabbing a toy fishing pole and whacking her with it. He thought it was so funny. It struck me. That’s exactly why the anti-GMO folks aren’t supporting the Joint Fact Finding report on Kauai, despite demanding it. There are facts presented to show a story but it simply doesn’t fit the story they want to believe. A logical way of using the available data would be to seek more data but the absence of harm will never prove safety in their eyes. The activists have woven a story and the facts presented threatens to unravel it. The best they can do is revise the facts and continue that story. The story is what defines this culture that they want to keep intact. Logic, critical thinking, and reason do not play well in a fiction tale as my 10 year old daughter confirms. It’s clear that Sarah and Geraldo, the two members with the most expertise and education related to this issue, didn’t want a subjective story. They wanted to set out on the actual goal to get the facts first and write a non-fiction, objective piece but that just could not happen with the other members. It’s clear that facts are being denied and it’s about the art of politics. It all just makes for a captivating story that continues the drama. I decided today I’d get some shopping done after work and stopped at Times Supermarket. As I was picking my produce, I glanced over at the checkout counter to anticipate how busy it was. I noticed that nearly 1 in 10 customers checking out did not use reusable bags. The majority of people were leaving with at least 3 of the thicker plastic bags in their carts. I had to laugh inside about this. 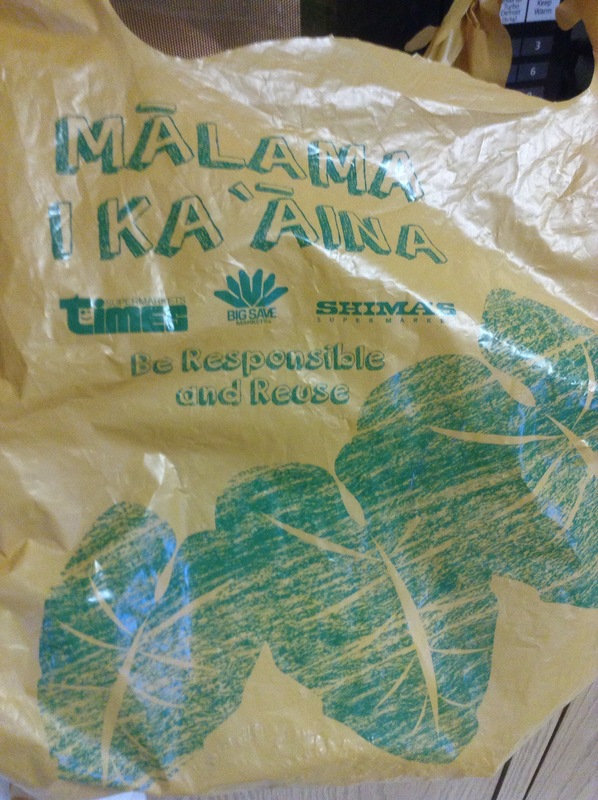 In Honolulu county, the environmentalists celebrated passing a plastic bag ban several years ago. Despite this “win” for them, I can’t help but question if it truly is making a positive impact if I still see plastic bags around. 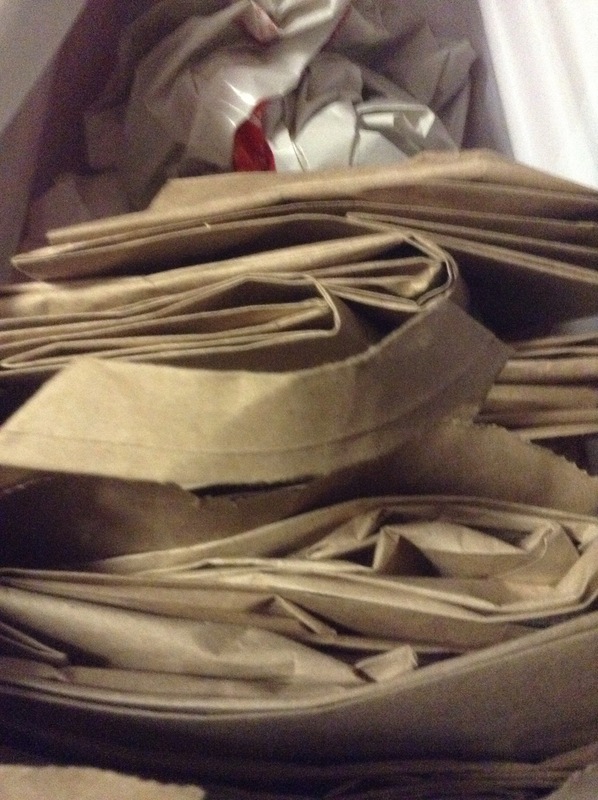 Not only are thicker bags around, I’ve got a stock pile of paper bags now because my husband forgets his reusable bags. These bags tear way more easily and are much harder to carry when you’re in tow with a wiggly toddler and school backpacks. These are filling up our closet. The part bags and the thicker bags clearly require more energy and input to produce. So I have to think if we really are saving the land with these actions? Have we made a greener choice? If I look at the environmental legislation passed in Hawaii, I think that the short feel good laws haven’t been thought through enough before being passes. Another example of poor legislation is the tourism issue at Hanauma Bay. In this past week, the Honolulu Star Advertiser reported on high volume of tourists coming in via taxis. A law was passed to curb tour companies from bringing in bus loads of people to minimize the impact on the bay. It apparently isn’t working since there is a loophole with other modes of transportation. Was the law really fulfilling its intent? The same type of thinking applies to the anti-GMO issue. With all the fear mongering around biotech, the green groups aligned with the Hawaiians to demand a ban on biotech taro research. Instead of keeping an option open to build some evidence on how to address major plant dieseases that could devastate the crops, the shortsighted thinkers took away a tool. What is evident is that a new disease is hitting farmers and what tools will they have sustain their livelihoods? Where in mythology was there a way to save a figure? With companies caving to GM free ingredients, there is a consequence. It might mean more insecticides and different management of weed control. So consumers who associate GM with pesticides may actually be returning us to using more of it. To the consumer who is feeling like they saved the earth by their purchases, they actually did the opposite in reality. I’m starting to wonder if going green is really a good thing if the ones backing it are setting us up for failures in the future. 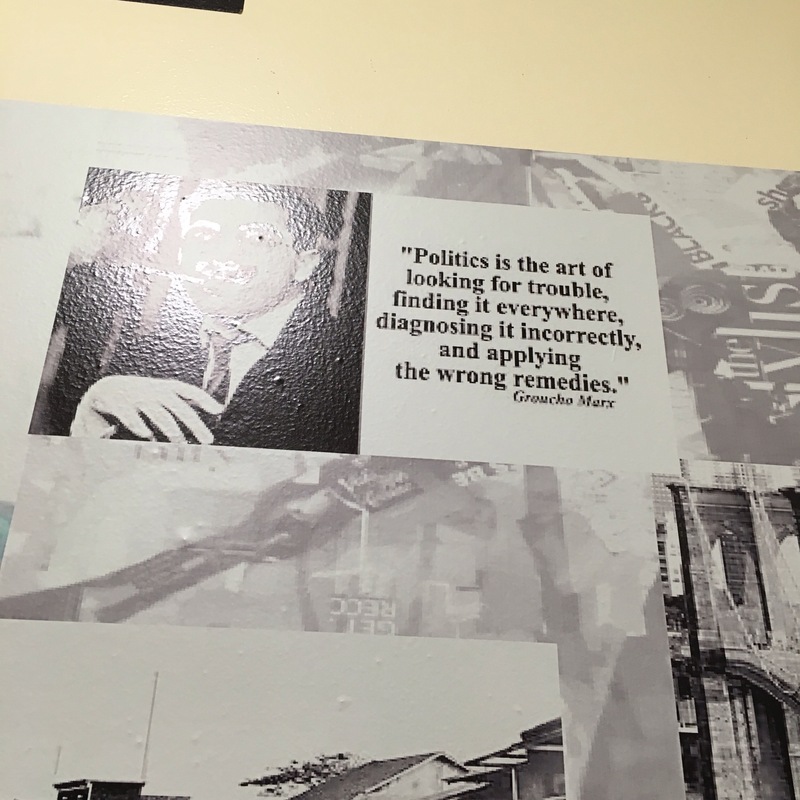 Did we consider all the consequences before setting to legislate on the issue? If we didn’t ask more questions, then we didn’t look closely enough at the results of our action. Then again, going green has had a good result in some ways. We have thicker plastic bags to hold more dog poop with and bags that don’t fly away!